Let's do this! LEEEEEEROY JENKINS!!! Leeroy Jenkins (sometimes misspelled Leroy Jenkins) is a paladin of the Alliance. 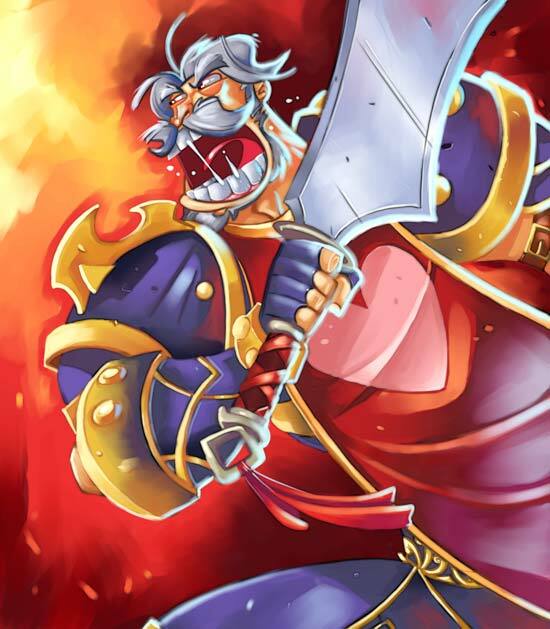 Leeroy Jenkins was made an official character in the World of Warcraft Trading Card Game as an epic ally card, number 198. His card represents one of the more notable inclusions of fan-created content into the Warcraft universe, as the character and catchphrase are taken from a popular video. Metzen was asked at San Diego Comicon if the character will ever appear in World of Warcraft: The Comic. He thought it was a good idea. Only time will tell if it ever happens. Jenkins also has a miniature made of him. The miniature is holding in his off hand a chicken drumstick, a reference to his quote "at least I have chicken". Leeroy also makes special appearances hosting certain events sometimes at BlizzCon. That's an internet meme because it's so popular but it's my favorite internet meme. In internet meme description, Leeroy Jenkins is a name of a World of Warcraft (WoW for short) character that is known for screaming out his name before ignorantly charging headlong into battle, killing everyone in his party. Though the video may have been staged, he was embraced by Blizzard Inc., making several appearances in WoW (World of Warcraft) products. Oh nuts! This meme is loudly as hell.